Are you looking for web and graphic design courses in Patiala? Contact Easy Web Plans features a wide range of web design courses. 1 review has been written for Easywebplans.home.blog yet. One of the best institute in Patiala providing web design courses to students. Easywebplans.home.blog presents an article about a specific topic. The web server used by Easywebplans.home.blog is run by Automattic and is located in San Francisco, USA. The server runs exclusively the website Easywebplans.home.blog. A Nginx server hosts the websites of Easywebplans.home.blog. For managing the data of the webpages the CMS WordPress is used. The website uses the latest markup standard HTML 5. The website does not specify details about the inclusion of its content in search engines. For this reason the content will be included by search engines. 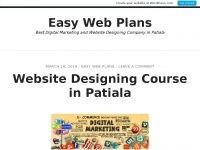 The visitors are redirected to the homepage of the website "/2019/03/16/website-designing-course-patiala/".